I want to introduce you to a new segment here... D.I.Y Beauty! Now, let's talk about something we all dread... Cleaning our brushes! 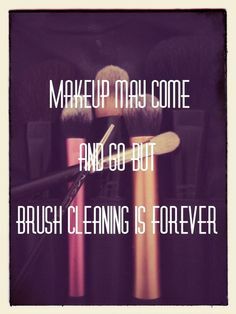 Let's face it, brush cleaner can get expensive and most of the cleaners are so filled with oils that it's hard to get through a few brushes before you start dropping them on the floor and having to clean them again. And some ingredients that can be in some cleaners you can't even pronounce! This is so easy, nothing but skin friendly ingredients, and you can customize it to your liking, plus can save you a TON of money! I decided that I wanted to use a mason jar instead of a spray bottle as my bottle tended to spring a leak. add 5-7 drops of your favorite essential oil. I chose lemon as it smells great and is perfect for a little aromatherapy pick me up first thing in the morning. Fill your container with water, leave enough room for the bubbles when you shake it. Now, let's test it out! I decided to go with my foundation brushes first to see how well it removes the makeup. Swish it in your cleaner a few times, squeeze out excess, and wipe on a dry cloth. Let them lay to dry. I literally could NOT believe my eyes! This cleaned my brushes so much better than anything else I have ever used! It's so easy and smells great!! The Essential oil filled the area as I was cleaning them! Wasn't overwhelming. Lemon is used in a lot of energy aromatherapy blends and definitely helped keep me going. Once your cleaner looks pretty dirty, rinse it out and add some more! Here we have my contour brush, foundation brush, concealer brush, a concentrated foundation brush, and a foundation serum brush. I literally cleaned all these in 4 swishes and a few wipes on my towel. I am so amazed they look like new! I have NEVER had a cleaner work this easy and this well. TOTAL: This cleanser cost me $0.51 to make! I would love to know what you think! Make it and try it out! Let me know in the comments below!! Would you like to see more D.I.Y Beauty? Let me know in the comments!